Review posted April 26, 2016. Abrams Books for Young Readers, New York, 2016. 44 pages. 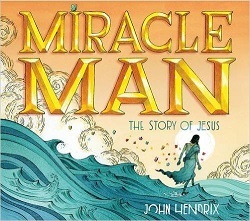 This is a picture book telling about the life of Jesus Christ, done by an accomplished picture book illustrator. Now, I personally am not completely crazy about the book, since I have my own conception of Jesus' story, and there's some necessary simplification. For example, he gives Andrew's lines to Peter (the only disciple named in this book, besides Judas) in the story of the feeding of the five thousand. But the more I look at this book, the more it's growing on me. John Hendrix makes the characters in the story look like Jews. Jesus looks tough, and his clothes are a little ragged. But the most interesting feature is that he makes the words of Jesus part of the art and larger than life. I am the Son of the living God who made the water and the winds. Did you forget who was in your boat? The story goes on with the feeding of the five thousand and Jesus walking on the water, including Peter walking on the water. ("Peter, have faith in my feet, not your own.") Then we come to the Last Supper and Judas' betrayal. The crucifixion is mainly alluded to -- very tastefully done for a picture book -- one page with Jesus carrying the cross and then a grand scene with the heartbroken disciples, and the women in a corner with Jesus' body, and the very walls of Jerusalem seeming to say, "It seemed the miracles had COME TO AN END." Then we have a spread from inside the empty tomb, graveclothes on a ledge, and Jesus outside in the light looking at a butterfly. had in store one last glorious miracle . . . I haven't seen another book about Jesus' life quite like this one. The word that comes to mind is Majestic. The Author's Note at the back explains why John Hendrix wanted to tell this story. I liked hearing that he was fascinated as a child by the words of Jesus in red in his Bible. You may have heard about the life of Jesus many times before, but my hope is to share the familiar story with you in a new way. Perhaps the best way to experience the Easter story is to momentarily forget about the trappings of religion around it and see the man at the center. In my experience, the story changes when we think of the people who experienced Jesus in person during the time he walked among us. Those people didn't have a steepled church building or know anything about Christian theology. They simply met a man, some of them for only a brief moment, and they were changed forever. Most of all, the author's love for the Miracle Man shines through. This book is a wonderful way to tell children about Him.